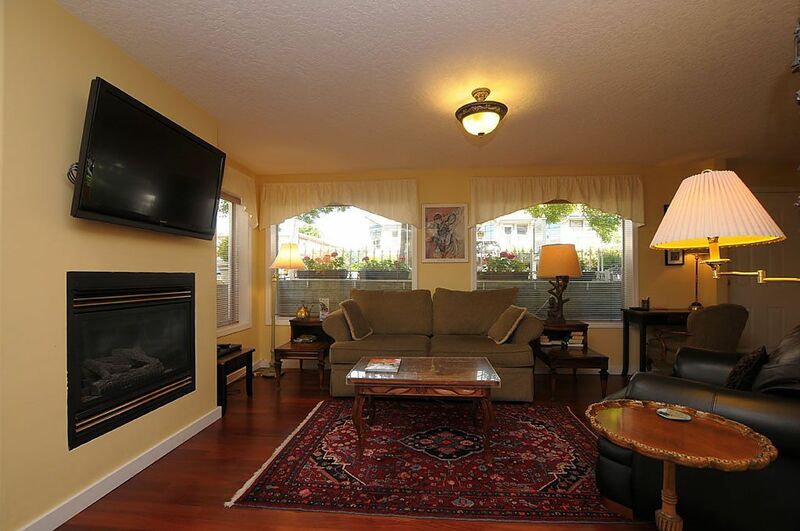 This spacious suite features radiant heated hardwood flooring, a gas fireplace and lots of art work collected from other countries, with very comfortable furnishings and large TV. The bedroom has a king size bed with a down comforter for extra sleeping pleasure, plus a large walk-in closet. The tiles of the modern newly renovated en-suite bath are also heated. No more cold feet for our guests. This quiet seaside neighborhood is in walking distance to most tourist attractions, restaurants and museums Victoria has to offer. Supermarkets and stores are just a block away. A few steps takes you to the ocean and the 8 mile long walkway, perfect for an early morning jog or walk. You can see the Olympic mountains across the water and the cruise ships coming in.suite is 660sq.ft. My husband Mike and I came to Victoria in 1994 and fell in love with the city, the ocean and the mountains. Victoria is filled with tourists in the summer and snowbirds in the winter, a perfect scenario for a vacation rental place. Now we meet people from all over the world, what can be more interesting. Our customers tell us we are in a perfect location. A quiet street, two houses off the ocean and the ocean walkway and just ten minutes walk to dowtown. Half a block away is a corner store and bus station and one block away you'll find a shopping plaza with a supermarket, drug store, liquor store, Starbucks, walk-in clinic , restaurants and so much more. We thoroughly enjoyed this roomy 1 bedroom apartment. Very bright with a separate entrance from a quiet street. The cable tv had all the sports and movie channels as well as Crave. It is only a couple of hundred meters to Dallas road and walks along the ocean, Thriftys is only two blocks away and the inner harbour about a 15 minute walk. All we expected and more. Beach take a picnic and watch the sunset. Thank you Georgina ,glad you enjoyed your stay.Please come and visit us again. Menzies Manor commands a great location: right beside the ocean, near Beacon Hill Park, a few blocks from the James Bay community with Thrifty's, liquor store, coffee shops and restaurants, and for those who like to walk - walking distance to the Inner Harbour and downtown Victoria. Our unit had everything we needed and was exceptionally clean. Mike, the owner, is always available. This is our go-to place when visiting Victoria. Called basically last minute and Mike was very accommodating and met us at the apartment with very short notice. The unit is very well kept, the furniture and decorations are very clean and nice, and that king size bed was so comfortable!! The ocean is literally about a minute walk away. Thanks, looking forward to our next trip. Thank you Glenn and Chantel,we'll see you next time your in town. Great place to stay! Everything you need is there for you and it is very clean. We enjoy the theme rooms. The owners are there for you at anytime. You are only steps from the ocean and downtown. Highly recommended. Whale watching and watching the cruise ships coming in.